If the investor is not bullish enough to buy a call outright but expects the share price to rise moderately, the bull spread is a lower cost way to gain exposure to such a market movement. The strategy consists of the purchase of a call option and the sale of a call option with a higher strike price. While the short call reduces the risk inherent in taking an outright call it also limits the profits that can be made. 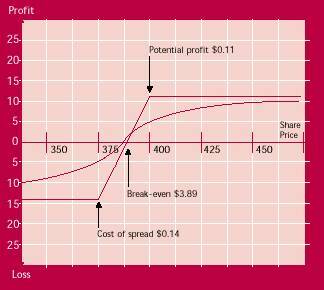 The maximum profit obtainable is the difference between the strike prices of the two options, less the cost of the spread. 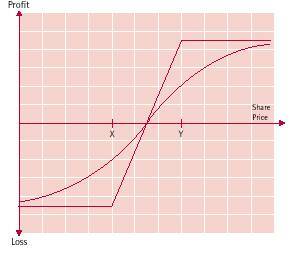 Maximum profit will occur if, at expiry, the share price is at, or above, the strike price of the sold option. If the stock rises quickly to this level, the spread will often be unwound early in order to avoid the risk of early exercise on the short leg. The higher delta of the long call means that the spread will increase in value as the share price rises. The maximum loss possible is the cost of the spread and will be incurred when the share price is at or below the strike price of the bought option at expiry. Limited risk/limited reward: the bull spread is a cheaper strategy than simply buying a call option. As a result, the profit potential is also reduced. Cost of strategy: the investor must be satisfied that the cost of the spread is worth the potential reward. Commission costs on entering and exiting will be greater for this strategy than when buying a call outright. If the stock unexpectedly rises sharply, it may be advisable to exit the strategy once the upper strike price is reached. Although time value is helpful around the strike price of the short leg, unwinding the strategy early removes the risk of exercise on the short call. If the stock price falls suddenly, the spread may be unwound before the taken call loses too much time value. Consider the bull spread when you are expecting a limited rise in the price of the stock. Do not 'leg in' to this strategy - enter the trade as a spread and unwind it as a spread. The bull spread can be constructed using puts instead of calls. As with the call spread, the investor buys the lower strike option and sells the higher strike option. The investor may decide to construct the spread in this way if the options are perceived to be overpriced. Since entering the put spread involves selling volatility, the higher option premiums will benefit the trader. In contrast, they make the call spread more expensive to enter. The bull put spread can also be viewed as writing a put with protection in place against a collapse in the market. In this case, the written put may be close to being at-the-money, with the taken put out-of-the-money. The maximum profit from the bull put spread is the premium received when the spread is established. The maximum loss is the difference between the strike prices less the premium received. The disadvantages of the bull put spread are twofold. Since the spread is placed for a net credit, collateral cover will be required. Secondly, the risk of exercise on the short leg is much greater than with the call spread, because the short put has the higher exercise price, and is likely to be around the money at the time the spread is entered. Any fall in the share price could result in early exercise of the short put.